By the 1850s Queensland’s greatest value to colonists was the pastoral potential of its land, all of which had been claimed by the British Crown. 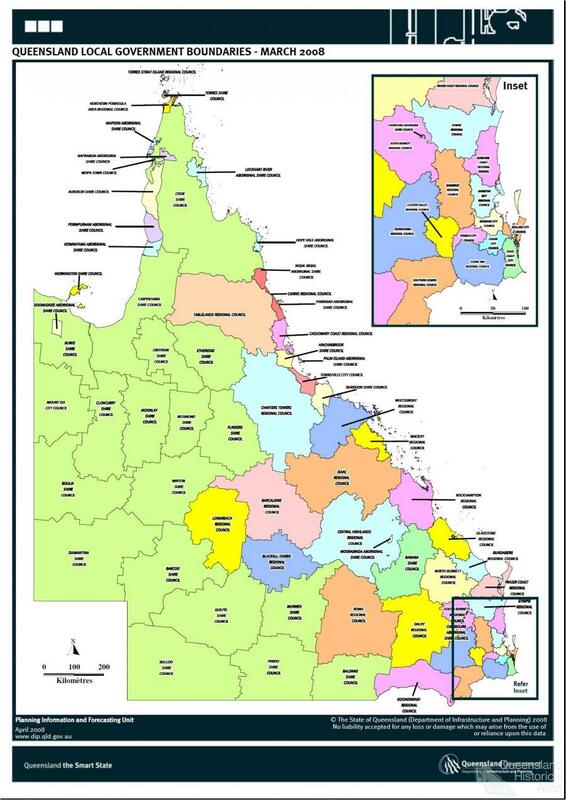 For the purpose of land survey and management the New South Wales government divided Queensland into twelve districts. At the granting of responsible government in 1859 most of the districts were designated as ‘unsettled’; the ‘settled’ ones being Moreton (Brisbane region), Port Curtis (Gladstone region), and Wide Bay (Maryborough region); the districts of Darling Downs and Burnett (Gayndah region) were partly settled and unsettled. Local government in Queensland began in 1859 with the creation of the town of Brisbane. 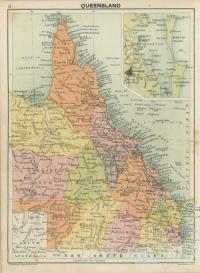 Subsequent towns and boroughs were Ipswich, Rockhampton and Toowoomba (1860), Maryborough and Warwick (1861), Bowen, Dalby and Gladstone (1863), Gayndah and Townsville (1866), Clermont and Roma (1867), Allora and Mackay (1869). These municipalities came from local voluntary impulses, aided by colonial legislation. The rest of the colony was devoid of local government, and looked like staying that way unless prodded into action. Premier Charles Lilley proposed in 1869 that the twelve districts become local government bodies, but that Moreton, Darling Downs, Leichhardt and Kennedy be divided into ‘East’ and ‘West’ or ‘North’ and ‘South’. (By 2001 East and West Moreton would have had 70% of Queensland’s population.) Lilley’s idea lapsed. In 1879 voluntary local government was replaced with compulsion, with the colonial government empowering itself to create local government divisions in rural Queensland. Existing municipal towns were left alone. On 11 November 1879, 65 divisions were created, all in haste. Lacking data about communities of interest or practical municipal boundaries, the Lands Commissioners offered the census districts as a template. Booroodabin (Fortitude Valley) of three square miles and Woolloongabba of four square miles were each made a division, as was Diamantina of nearly 40,000 square miles. There were also small divisions around Ipswich, Toowoomba and Beenleigh. In 1902 the divisions were restyled as shires, and in all the municipalities numbered four cities, 29 towns and 127 shires. During 1916-19 the Ryan Labour government embarked on local government amalgamations at Charters Towers, Maryborough, Ipswich, Toowoomba, Bundaberg and Rockhampton. The biggest change was in the Ipswich area where Bundamba, Lowood, Purga and Walloon were amalgamated as Moreton Shire; Brassall was added to Ipswich City. A more spectacular reform came in 1925 when the Theodore Labour government amalgamated the City of South Brisbane, six towns, ten shires and parts of two other shires with the City of Brisbane, the only local government authority in the state to have its own Act of Parliament. In the far north at Cairns, Cooktown and their hinterland, there had been a splitting up of the original (1879) divisions when mining towns grew and agriculture intensified. The 1879 divisions were Cairns, Hann (Maytown and the Palmer River goldfields), Woothakata (Thounborough, Hodgkinson River goldfield), Einasleigh (Georgetown, Etheridge goldfield) and Daintree (Cooktown). During 1880-1910 six new divisions and towns were hived off from three of the original divisions: Douglas (1880); Tinaroo (1881) based at Atherton; Cairns borough (1885); Walsh (1889) based at Montalbion and Irvinebank; Barron (1890) based at Cairns; Chillagoe (1908); Eacham (1910) based at Malanda. Beginning in 1919, the process went into reverse when Barron Shire was abolished and divided between Cairns and Woothakata. 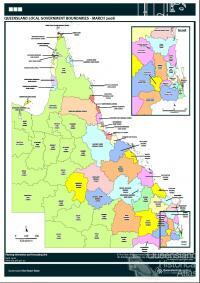 Next year Hann Shire was amalgamated with Daintree Shire and Cooktown, forming Cook Shire. In 1932 Woothakata Shire absorbed Chillagoe and Walsh shires. 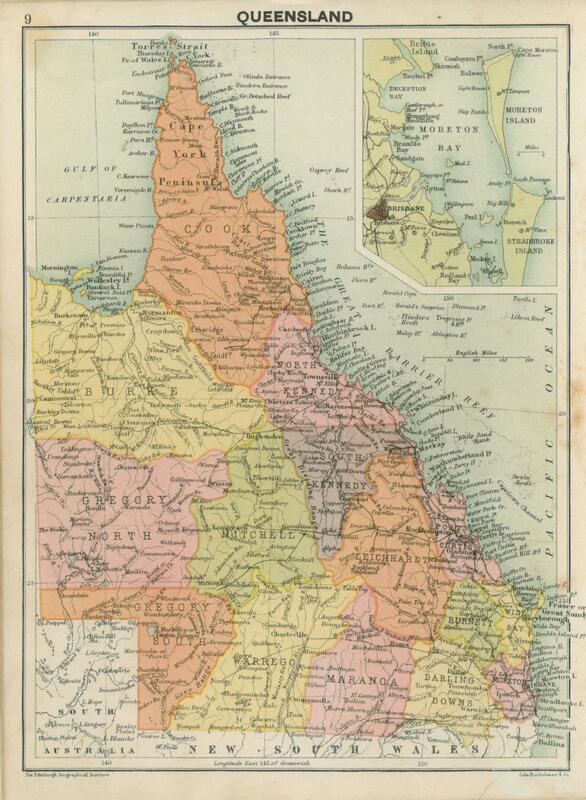 Its name was changed to Mareeba in 1947. In 1995 Cairns City absorbed its surrounding shire (originally named Cairns but renamed Mulgrave in 1940). Mulgrave Shire (1737 square kilometres) had a substantial urban population, and increased Cairns City’s from 43,000 to over 100,000 after amalgamation. In the amalgamations in 2008 Douglas Shire was united with Cairns City and Atherton; Eacham, Herberton and Mareeba Shires were amalgamated as Tablelands Regional Council. In the far north there had been a return to the pattern set in 1879: for Cairns and Douglas divisions, Cairns City; for Woothakata division, Tablelands Regional Council; for Hann and Daintree divisions, Cook Shire; and Einasleigh division, renamed Etheridge, remained as Etheridge Shire. Around Townsville there was a different story. Townsville borough (1866) originally had less than four square miles, and pressing in on all sides there was Thuringowa division (1879), an area of nearly 3000 square miles. As Townsville’s urban growth spilled into Thuringowa, a piece or pieces were added to Townsville; Belgian Gardens, for example, was in Thuringowa until 1918. The boundary changes, however, did not keep up with urban growth, and Thuringowa was restyled as a city in 1986. In 2008 both cities were amalgamated. When local government divisions were proclaimed for the Darling Downs there were six. In 1913-14 the smallest, Gowrie (23 square miles) was abolished, but four more were created by excisions from those remaining. The number had been whittled down to seven by 2008, and they were bundled into one with Toowoomba. So influential was Toowoomba on the region, the new council was named not Darling Downs but Toowoomba Regional Council. In 1900 a map of Queensland’s local government looked like an assemblage of outback spaces and coastal fly specks. By mid-century many of the fly specks had been removed. But inhabitants had grown used to their local government areas, even if some had come from nineteenth century census districts. The hotly contested amalgamations by the Beattie Labor Government in 2008 made for a simpler map, more than halving the number of councils from 157 to 73, but in many places they lacked public acceptance. Isisford Shire (population 262) steadfastly asserted its right to continue, but it was amalgamated with Ilfracombe and Longreach Shires. Barcoo Shire with 360 inhabitants, but vaster and more remote, continued.